As we watched, a familiar figure emerged out of the shadows. ‘Here he is – your own, your very own, Professor James Moriarty!’ The Hooded Claw waved his hook enthusiastically and the two villains embraced. The Claw grinned and clicked his fingers. In an instant his men had grabbed Moriarty and tied his arms and legs using some of the leather straps from either side of the circular saw. ‘Claw! Claw,’ What’s going on?’ yelled the villain, struggling helplessly against his bonds. ‘Come on, come on,’ urged the Claw, waving his arms. 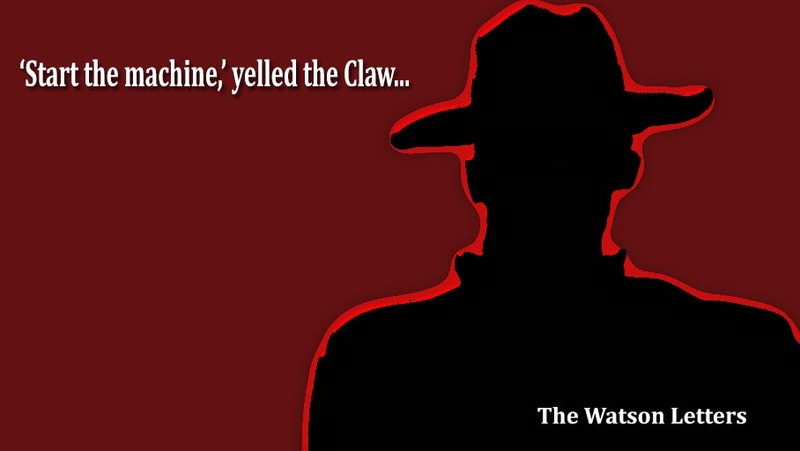 ‘Hah!’ yelled the Claw triumphantly. ‘Sorry, what?’ said the Claw, his lower lip trembling slightly. ‘What?’ exploded the Claw, jumping up and down. He barked out a series of orders and watched as his men tied the Professor onto the conveyor belt, legs wide, in a position that would enable his body to be sliced perfectly up the middle. ‘Start the machine,’ yelled the Claw. One of the henchmen pressed a button and the circular saw screamed into life, its shimmering silvery disc demanding everyone’s attention. Another button was pressed, and the conveyor belt began to trundle along, propelling Moriarty towards what would be a quick, but painful death. It was dark when, some twenty minutes later and accompanied by a bevy of villains, we arrived via two rowing boats at the shore. 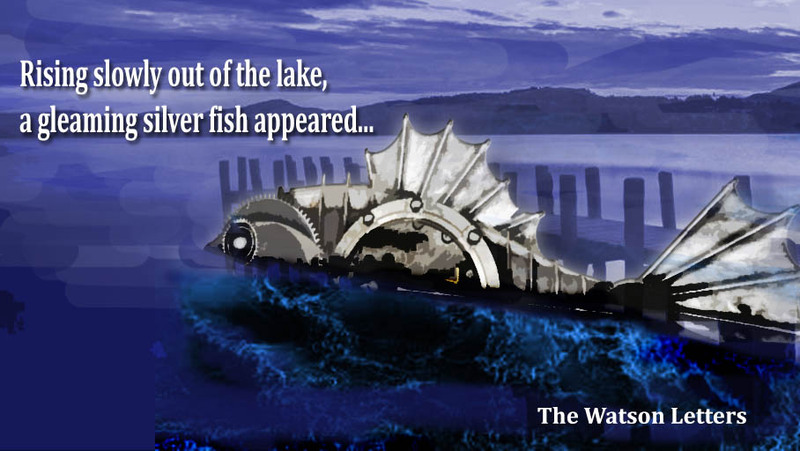 Looking back at the vessel we had recently been extricated from, I wondered how the Claw expected to keep the thing hidden from public view – after all, being in the shape of a gigantic metal fish, it did seem unlikely it would not attract attention. 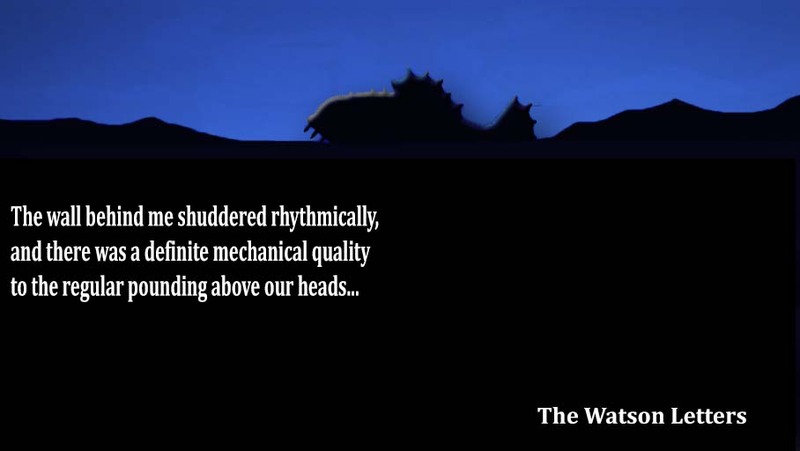 However, as I watched, the metallic beast closed her hatches and slowly disappeared beneath the waves. ‘You are wondering where I keep it, eh?’ said a surprisingly softly-spoken Claw from his seat beside me. He giggled girlishly, gave me a playful punch on the arm, then resumed his usual gruffness and barked a series of orders at the crew. From the look of the buildings ahead of us, we were making for a large warehouse a few yards up from the wharf. I noticed several other buildings behind the main one, though these were not lit up and the only signs of life came from the crowd of henchmen who were engaged in getting us out of the boats and into the warehouse. As we trudged up the shingled beach, I tried to make out the details of the various pieces of apparatus that had been arranged just inside the huge double doors of the warehouse. A feeling of déjà vu wafted over me as I stared at the long workbench, the conveyor belt on top and the scarily-familiar circular saw that slotted into it at one end. Beneath the bench and the saw, sat a small steam engine, and as if that wasn’t enough to cause me to fill my trousers several times over, the horrific picture was completed by a series of leather straps fastened on either side of the table. Hustling us inside, the henchmen lined us up against the wall and tied our wrists together. Holmes was tethered to me, me to Mary, and Mary to Penny, so the only chance of absconding would demand that all four of us cooperate. Though, at that moment, the possibility of escape seemed like a remote and highly unlikely scenario. We all looked at each other, none of us wishing to state the obvious. Finally, Holmes spoke. The Claw laughed heartily. ‘Very good, Holmes, very good. 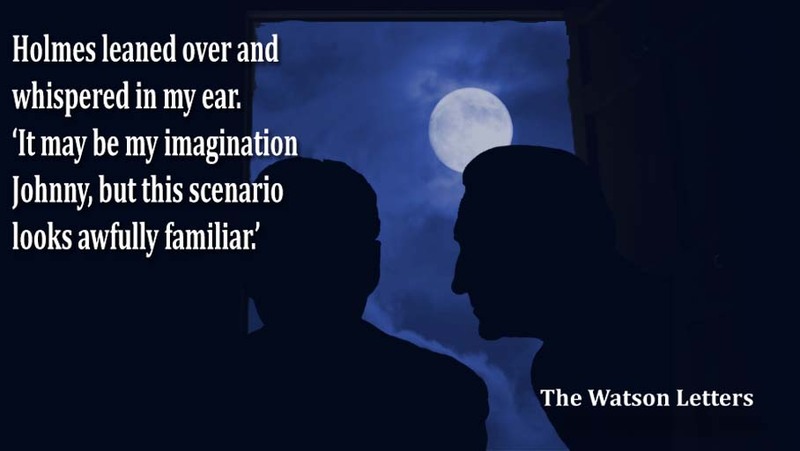 But no, that is not my intention.’ He paused, as if waiting for Holmes to make another suggestion, but the big-nosed detective said nothing more. ‘Very well, then,’ the villain continued. ‘As you have surmised, these items of equipment came from an auction house in Scotland. I learned of your involvement with them via a friend of mine. In fact, that same friend is here with me tonight.’ Holding up his good hand, he clicked his fingers. The various henchmen gathered around the edges of the warehouse burst into a round of applause, which only ceased when a man emerged out of the shadows and made his way to stand by the side of the Claw. As the train picked up speed, I cast a swift glance around our compartment. Naturally there was nowhere to hide – even the luggage racks that stretched along each side above the seats, would barely conceal a couple of suitcases, let alone three fully-grown individuals. But then a thought came to me – all we required was a chance to gain the upper hand and even a few seconds might mean the difference between living and dying. The ladies exchanged a look and suitably chastised, proceeded to clamber up into the aforementioned spaces. Gazing down at the seats, I was reminded of one of Hannibal Lecter’s more ingenious disguises, when he concealed himself in a Paisley-patterned train-seat-suit and surprised us brandishing a large kitchen knife. Clearly, I hadn’t the time or resources to camouflage myself in such a way, but I did have another weapon at my disposal that might do the trick. Taking off my shoes, socks, trousers and undergarments, I took up a position with my legs apart, spanning the gap between the seats. With one foot on each seat, my proud manhood dangled menacingly by the door at what I judged to be face-height. Whoever slid the door open first would get a truly surprising eyeful. Mary joined in with an amused titter, but their enjoyment was cut short when the slap, slap of heavy footsteps sounded from the passageway. “Get ready, they’re coming,” I said, holding Harry’s machine pistol at a jaunty angle. The footsteps grew closer then stopped outside our compartment. There was a pause of a few seconds before the door was thrust aside on its runners, slamming it home with a resounding thud, an action which caused me to drop my pistol. It clattered to the floor and bounced under one of the seats. 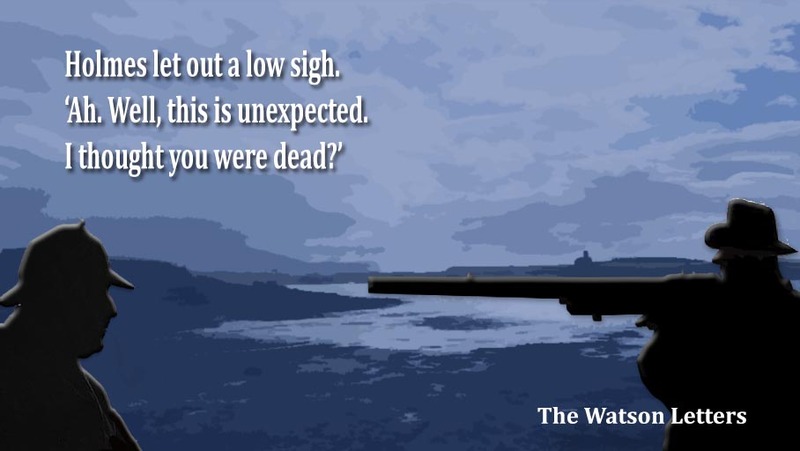 “Oh, nice one, Doctor Watson,” said the first man (who had given up any pretence of being blind). With a hoot of derisive laughter, he pulled out a revolver and prepared to blow my tackle to Kingdom Come. But assuming he had the upper hand, he made the mistake of turning to his companion (no doubt to cast further aspersions on my apparent stupidity). As his head swivelled sideways, the end of his gun touched my naked belly. It was all I needed to jerk myself into action – the sensation of cold steel pressing against my vulnerability had the desired effect and my muscles contracted, then immediately relaxed, and a stream of urine spurted forth and hit the first man in the eye. The glistening torrent then ricocheted off his face and into the second man’s mouth. I couldn’t have planned it better if I’d tried. Dropping deftly to the floor, I grabbed the machine pistol from where it had fallen and jabbed it in the man’s ribs. The red-headed henchman next to him busied himself spitting out my discharge and wiping his tongue vigorously on the sleeve of his jacket. Reaching forward, I pulled a revolver from his pocket and tossed it across to Mary, who had climbed down from her perch to lend a hand. Penny slid down onto the seat and took off her stockings, before tying the hands of both men behind their backs. Ripping off the cording from along the seat-backs, I tied the men’s legs too, just in case. Oddly, the villains seemed unaffected at having been overwhelmed. They sat quietly and apart from the occasional rueful glance, made no attempt to communicate with each other or to regain their former dominance. Mary and Penelope kept their weapons trained on the pair while I dressed, then seating myself opposite, I studied each of them in turn. The red-head was the younger of the two and appeared more subdued than the other, though even he showed little sign of concern at his capture. The older man had all the hallmarks of a seasoned villain, which I now realised should have been obvious to me earlier. “So you work for the Claw, then?” I said. “I expect he’s at the Institute, eh?” I tried. “Hah,” said the red-head, but before he could say more, his companion gave him a hard stare which shut him up like a clam. With a sigh, I saw that it would be pointless to pursue further questions, so sitting back, I considered our options. I had no wish to continue this vigil for the next few hours, so we’d have to find somewhere to lock the pair of them away. Knowing there was a guards-van attached to the train, it would be an easy matter to shut the villains in there and telegraph ahead for them to be picked up when we reached our destination. It was the simplest solution and would leave us free to enjoy the rest of our trip without the worry of constantly watching our prisoners. Sending Mary off to find the guard, I sat back to wait. Penelope had taken the window seat and also kept her gun aimed at our detainees. I was glad to note the look of quiet fortitude on her face – she had taken to the role of ‘detective’ as easily as an otter slides into a pool of water. It was a few minutes later before I heard my wife’s footsteps returning along the passageway. Standing, I cocked my head around the doorway. Mary’s face was oddly expressionless, her eyes had a strange lifeless quality and there was no welcoming smile telling me everything was in hand. Something was wrong, but even though a shiver ran up my spine, it was a few seconds more before I realised why, and even then, I was momentarily thrown off-guard. A man in a black fedora was following behind Mary. Thank God, I thought, Harry had made it onto the train. But as the stranger lifted his head, my stomach dropped into my boots. But the Claw’s other hand had come into view and I saw the glass syringe and its lurid green contents. “What have you done?” I barked helplessly. It was while I waited for the clerk to arrange our tickets at the station that I realised my mistake in assuming our nemesis would not be nearby. Mary and Penelope had retired to the waiting room armed with a tray of sandwiches, a pot of coffee and my revolver (the latter concealed in Mary’s handbag). Penelope too, had a handgun hidden about her person, just in case. Keeping half an eye on their table through the adjoining door, I scanned the area for possible threats. At once, I spotted three dubious-looking men who might easily be on the side of the damned Claw. All three were plainly dressed, had swarthy or ruddy faces, and were seated at separate tables, drinking tea. This was not in itself unusual – it is a well-known fact that the English working man is rarely comfortable in the company of others and will often secrete himself away from the gaze of fellow workers in order to avoid the horror of being engaged in spontaneous conversation. The chap nearest to me held a copy of The Times up to his face, but I discerned from his oscillating gaze that he was no more reading it than dancing a jig. From where I stood, I could see the newspaper was not a recent edition (the crossword had been completed and one corner of the broadsheet was torn off). Noting the fellow’s eyes had fixed firmly on Miss Pitstop’s chest, I quickly dismissed him as nothing more than a lustful hireling, utilising a day-old newspaper as a prop for eyeing up young women. Turning my attention to the other two men, I immediately saw that one was roughly middle-aged, had a white stick at his side and a hand-written sign pinned to his jacket. The emblem declared the fellow to be a veteran of the Crimea who’d lost his sight in that terrible conflict. Clearly, a blind man was no threat to us. Lastly, a tall chap with a shock of red hair had seated himself at the table next to Mary and Penelope. I was reminded of The Case of the Red-Haired League and for a moment found my mind drifting back to that lusty young chap whose fortune Holmes and I had recovered when we exposed a scheme to rob the poor lad of his savings. Perhaps it was for this reason that I dismissed this man too from my scrutiny. At that point, a newcomer wearing a black Fedora and greatcoat entered the waiting room and immediately approached the women’s table. “What’s that?” I exclaimed, turning back to face the ticket master. “Yes, yes, I heard you the first time,” I said, tossing the required coinage across the counter and grabbing the tickets from his outstretched hand. Ignoring the man’s continuing commentary, I hurried into the waiting room to find the stranger standing with his back to me and speaking in low tones to Mary. “Really, you know about t’Claw an’all?” said Penelope, her eyes taking in Harry’s huge shoulders and winning smile. As surreptitiously as possible, I made as if to look back at the ticket office and as my eyes drifted past the war veteran, I saw that he was looking straight at me. The former blind man had dropped his eyes, so I took the opportunity to take a good look at him. Now of course I could see the all the clues as plain as day – being no more than forty years old, he couldn’t possibly have taken part in the Crimean War, and the hairline around his forehead showed the edge of an elasticated band of the type used to fasten hairpieces in place. No doubt the white stick leaning against his table was just another prop to aid his pathetic disguise. “Ah, I see,” I said, feeling small. “And just to prove it…” Harry stood up cautiously, making not the slightest sound. Then, taking two steps towards the other man, he deftly lifted the white stick from where it stood and passed it across to me. The man did not move, but started straight ahead, as a true blind man might, unaware of the theft. Taking hold of the stick, I immediately realised that it was not constructed from wood as I’d have expected, but from some sort of painted metal. Twisting the handle, I was amazed when it came away in my hand, revealing the razor-sharp blade inside. 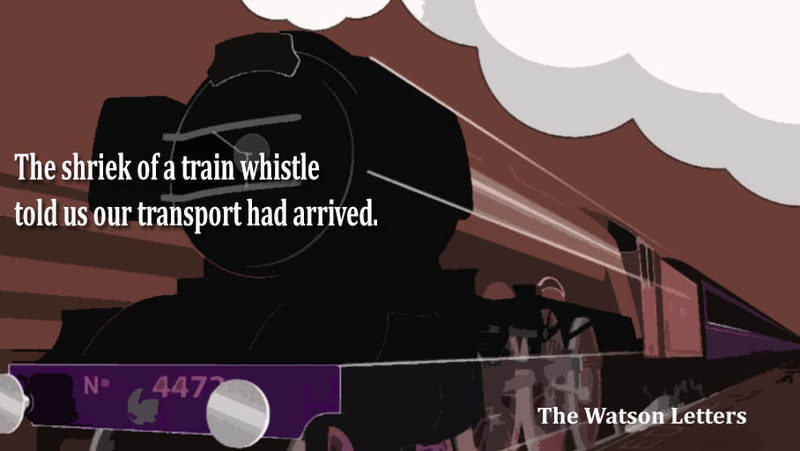 The shriek of a train whistle told us our transport had arrived. “You can thank me when the Claw is in custody. For now, take this.” He pushed something into my hand and looking down I saw that it was a machine pistol – the latest American model. A moment later, the three of us were climbing onto the train. Leaning out of the window as we chugged out of the station, I saw Harry pull back an arm in readiness to smash the blind man in the face, but before he could do so, the other two so-called working men had jumped up and grabbed Harry, throwing him back against the counter. 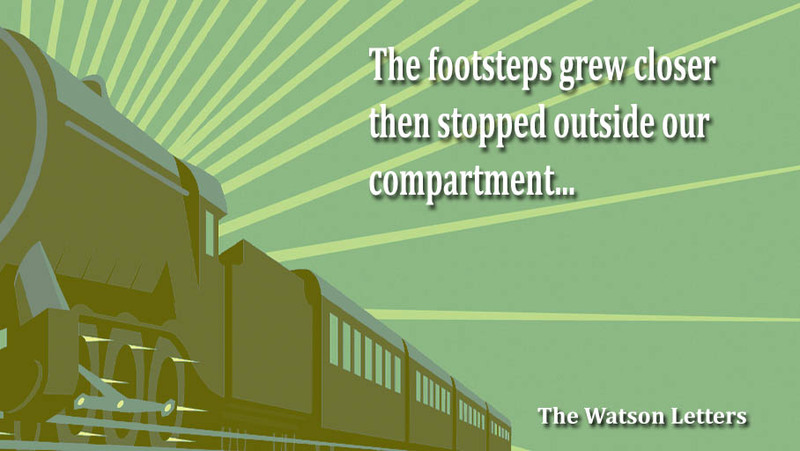 A second later, they were running up the platform and clambering aboard the accelerating locomotive. “We’ve got company,” I said, sliding the window closed. Mary and Penelope exchanged glances, then reaching into their respective handbags, pulled out their weapons.